A contest called Put Your Ethics Where Your Mouth Is by The New York Times, has recently tried to figure out who can write the best argument supporting the idea that meat is ethical. Panelled by Mark Bittman, Jonathan Safran Foer, Andrew Light, Michael Pollan, and Peter Singer, I was eager to read what their picks would be. “Many animals, however, while they can be well off or poorly off in certain ways at particular times (e.g., by experiencing pleasure and pain), seem unlikely to be capable of becoming better off in their lives considered as a whole — or at least not once they have had certain basic needs met. While they may be capable of relationships of a kind, it is doubtful that these can grow and develop in the ways ours can. Indeed, it is uncertain whether most animals even have identities that span weeks, let alone years. If all this is right, then once such an animal has had her basic needs met, a painless death cannot harm her, at least not in the sense in which harm is necessary for an event to be bad. Since it is not bad to kill such animals, it cannot be morally wrong.” ~ Meat Is Ethical. Meat Is Bad. To understand why “humane meat” is unethical we must understand what pain is and why it exists. Pain didn’t just become a part of our biology for no reason — it serves a very valuable purpose: pain exists to help us learn from mistakes. As children, many of us have put our hand in a flame and felt the incredible heat of the flame set off pain nerves in our hand which travelled up to our brain. This taught us the valuable lesson that putting our hand in a flame is a bad idea, and we are sure to be more wary of repeating the behavior in the future. The part of the brain that is activated when a sentient being encounters painful stimuli is located very near to the center of the brain. The further into the brain you go, generally, the more primitive the function. All sentient beings have had this amazing function for millenia because it is very effective at teaching us what to avoid, enabling us to live long enough to procreate and pass our D.N.A. on to the next generation. This isn’t something exclusive to humans; this is one of the most basic functions of almost all animal life on our planet. If sentient animals are capable of learning (proven by their ability to feel and learn from pain), then it isn’t very hard to acknowledge that animals are also capable of forming relationships with one another, and are able to grow as individuals with their own distinct personalities. Anyone who has ever lived with an animal, whether that animal was a cat, dog, tortoise, parrot, lizard, rabbit, chicken, cow, pig, etc., will tell you that no two animals are alike. They each have their own way of doing things — their own nuances that are often so subtle it takes a very perceptive and observant human to even notice. We must remember, most animals (unlike dogs, who have evolved alongside humans for thousands of years) are not concerned with conveying their emotions to us, or deciphering our emotions. They have no interest in it because for much of history they haven’t needed to. Dogs have benefitted a great deal from gradually developing the ability to read human emotions in facial expressions as well as voice inflections and vocal patterns. Because of our relationship with dogs, we have also learned to read their emotions and are quickly able to know whether a dog’s bark is one of anger, joy, pain, or fear. We don’t have thousands of years to learn each of the different emotional languages of every species on the planet — we simply need to realize that they exist, and if we look hard enough for them, we just may be able to see and understand them ourselves. Animal products (especially meat) are not necessary for human survival, in fact they are counterproductive to it. They help cause numerous diseases including cardiovascular disease, obesity, type 2 diabetes, osteoporosis, rheumatoid arthritis, as well as many disorders including A.D.D., A.D.H.D., and autism, and even common ailments such as acne, hormone imbalance, lethargy, migraines, irritable bowel syndrome, constipation, and insomnia. A question we must ask ourselves is: are we treating our bodies “humanely” by consuming animal products? Another question to ask ourselves is whether we are treating our planet “humanely” by consuming animal products. Even when raised “sustainably”, livestock requires the use of many resources including fresh water, fossil fuels, and space for animals and slaughterhouses to occupy. For example, if animals are pasture-raised, they need that much more land to occupy and graze compared to the intensively condensed feed-lots used in factory farming to “finish” animals; this means that more rainforest will have to be cut down at a faster rate to make room for these so-called “sustainable” farming practices. I’ll go further into this subject later. The idea of “humane” meat or any kind of “humane” animal product has baffled me since I became a vegan. The word “humane” conjures images of benevolence, kindness, and compassion. In sharp contrast, the word “slaughter” conjures images of agony, blood, and death. Common sense tells us that when these two words are combined to form “humane slaughter” or “humane meat” that these are perfect examples of oxymorons. After all, how can one be kind while ending someone’s life? Are the people in support of these “humane” animal products really meaning to say “less cruel”? Since when did simply being less cruel make someone kind? This brings me to my point: if animals can feel pain, form relationships and develop unique personalities, then death is something harmful for the animal who experiences it and is therefore unethical. The definition of “humane” is: showing evidence of moral and intellectual advancement. How morally and intellectually advanced is our species if we cause unnecessary pain to innocent creatures and in doing so, cause unnecessary pain to our own bodies and our planet as a whole? “Production of vegetables without the use of animals requires much larger amounts of energy. In small-scale farming, we use animals to clear fields of vegetation instead of relying only on industrial systems like tractors and herbicides.” ~ We Require Balance. Balance Requires Meat. The authors of these essay’s are actually making a very good point: nature intended for animals to recycle nutrients into the soil — animals are perfectly built for this task — and any sustainable farming system should recognize this and employ it. How this relates to meat being ethical is puzzling to me. There seem to be a few links missing from the chain between needing animals manure to cycle nutrients and meat being ethical. This is for the simple fact that in order for animals to create manure, they need to be alive: no meat required. Killing and eating them has absolutely nothing to do with necessary, sustainable nutrient cycling. We have enough food to feed people dying of starvation in poorer nations, but this food is instead being fed to livestock to fatten them up, who are then slaughtered to fatten us up. If everyone ate a vegan diet, we would be able to feed the world. We also need to look at how many plants are necessary to grow livestock large enough for slaughter versus simply growing plants and consuming those nutrients directly. We take in a much higher and more diverse array of nutrients from eating one pound of plant foods than we do from eating one pound of meat. Meat (depending on the type) is generally abundant in a few select nutrients that are actually good for humans, those being: iron, omega-3 fatty acids, vitamin B12, zinc, vitamin B6, selenium, phosphorus, niacin, riboflavin, and choline. Plant foods (depending on the type) are generally abundant in all the beneficial nutrients found in meat, plus many more, including: vitamin A, thiamine, biotin, folic acid, vitamin C, vitamin D, vitamin E, vitamin K, potassium, calcium, magnesium, manganese, selenium, and molybdenum, as well as ALL of the essential amino acids. Of course, we have to remember that one pound of plant foods is generally not nearly as calorically dense as one pound of meat; we would need to consume many more pounds of plant foods to equal the same amount of calories in one pound of meat (but in doing so would also be consuming that many more nutrients). This also depends on the type of plant food and meat we are discussing. For instance, whether we are talking about cauliflower (less calorically dense) or avocado (more calorically dense), or chicken (less calorically dense) or beef (more calorically dense). Lastly, we must also factor in the amount of pounds of plant foods required to grow an animal to a size suitable for slaughter as well as the different types of animals slaughtered for meat and the different pounds of plant foods required to grow them to an acceptable size. For example, chickens require much fewer pounds of food to reach this weight than cattle. However, pound for pound, they are also less calorically dense and one would have to eat much more than one pound of chicken to equal the caloric density of one pound of beef. There are many factors to consider when determining whether plants or meat are more sustainable, but when weighed out we can see that we get more nutrition and calories from a varied, vegan, plant-based diet than we do from a varied, non-vegan, meat-based diet. That may be all butterflies and rainbows on the surface, but here in the real world there is a little more to consider than the over-simplified generalizations made by these authors. For one, we may all be just solar energy temporarily stored in an impermanent form but I’m pretty sure this doesn’t make killing humans ethical, so I have trouble seeing how this would make killing animals ethical either. After all, as far as trapped solar energy goes, we are no different from animals. In fact, the author actually makes an effort to point this out to us in their quote. Second, when choosing ethical food we must consider the above discussed topics of humaneness and sustainability. Now that we know that “humane meat” is an oxymoron and that sustainable plant farming is comparably lighter on the environment and ecosystem as well as our own health than sustainable animal farming, we realize that the only truly compassionate and ethically raised food is plant food. The last is the silliest reason of all for why meat should be considered ethical: to give thanks. After killing an animal and preparing to consume its dead flesh, it seems like a cheap consolation to “thank” the animal for what meat eaters usually refer to as the animals “sacrifice” or “gift”. Remember, if the animal had a choice in the matter it would still be alive, not sitting there on a plate, hacked into tiny bits. Thanking the animal doesn’t bring them back from the dead. It solves nothing. The only reason people feel the need to thank the animal whose body is sitting on their plate is to ease their own uncomfortability and guilt for knowing that this animal is dead because of THEM. It does absolutely nothing for the animal, but gives the person about to eat it’s flesh a false peace of mind, almost like they are giving themselves permission to disregard their guilt and eat. “The farm animal and the small farmer must cooperate to build a stronger herd or flock; we literally cannot survive without each other.” ~ We Require Balance. Balance Requires Meat. “…I learned quickly that animal husbandry teaches you more than anything else about the natural order, about life and death.” ~ We Require Balance. Balance Requires Meat. I do agree, we cannot survive without each other. But why is this so? In regards to humans, we rely on animals to cycle the nutrients in the soil, however this is not a reason for declaring meat ethical as we obviously don’t need meat to make this happen (as discussed above). In addition, we don’t need to consume meat to survive or even to thrive; vegans are living proof of this fact. In regards to animals, they rely on us for food, shelter, and often even for procreation. In fact, we have bred them to such an extent that if left to fend for themselves in the wild they would barely have a remote chance of survival. This doesn’t mean that confining them, exploiting them, and eating their flesh is suddenly permissible, as if this is their token of gratitude or payment for our providing them with basic things needed for their species survival. We made them this way. They wouldn’t “owe” us anything if we didn’t start tampering with their biology in the first place. They don’t “owe” us anything after the fact. If anything, we are the ones who owe them something for what we’ve done to their genetics through artificial selection — breeding them to such an extent that they would not be able to survive without us. If nothing else, the very least we can do to make up for our devastating actions against their species is to not eat them. In all actuality, we owe them far more than they could ever owe us. How is it the animal’s fault that the people who want to eat them live in the desert? If it really is that hard to grow crops there, wouldn’t the ethical thing to do be to move? 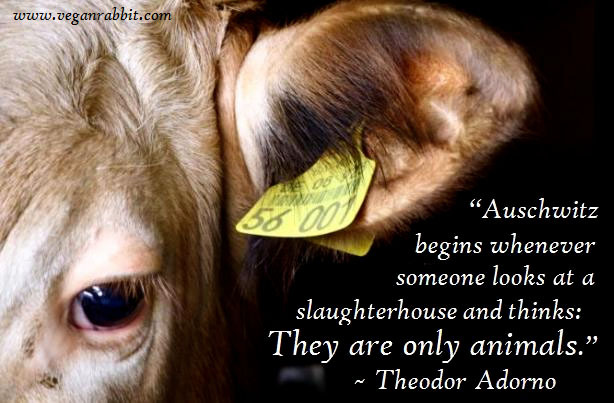 If one acknowledges that animals are sentient and can feel pain, how does the above argument justify their murder? In essence what the author is saying is that people’s right to live where they prefer is of higher importance than an animal’s right to simply live. Even if moving is not an option, if people are only subsisting off the flesh of corpses they will soon become corpses themselves, as humans require plant foods to survive. If people living in the desert are unable to “ethically” obtain these plant foods because of the barren land, maybe it is not agriculture that is the problem, but the geographical location they have chosen to occupy? “A single mother of three, working two jobs, tries to decide how to feed her children on a Thursday evening; she opts for chicken over lentils, not knowing how to prepare the latter in a way that ensures consumption. A young vegetarian goes home to visit his parents; they prepare choice cuts of beef in honor of his arrival; he eats them out of love. A family celebrates a major event with a roasted pig, killed at their hand shortly before; they acknowledge, by taking life, the significance of the occasion.” ~ For What Shall We Be Blamed — and Why? Let’s put aside our speciesist frame of mind for one moment and imagine that instead of chicken, cuts of beef, and a roasted pig, we are talking about humans, cuts of human flesh, and a roasted human. Before you scoff and argue that humans are so much better than other animals, remember that we are not looking at this from a speciesist perspective, but with an open mind. All we need to worry about is a being’s ability to feel pain. 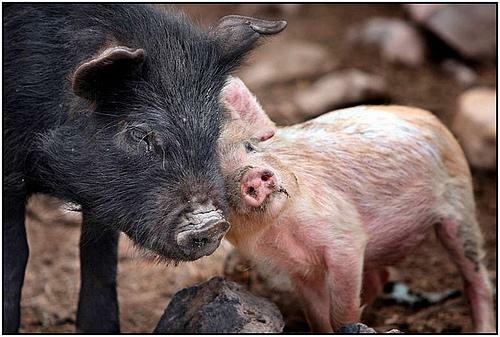 A being does not need to be intelligent, complex, or even beautiful to be able to feel pain. The only requirement is sentience. If a being is sentient it has the ability to experience both pain and pleasure. This is the most basic thing we have in common with all sentient life on the planet — the seeking of pleasure and the avoidance of pain. We also share the will to live. The people leading these oppressions never focused on the one word which binds us all to each other: sentience. 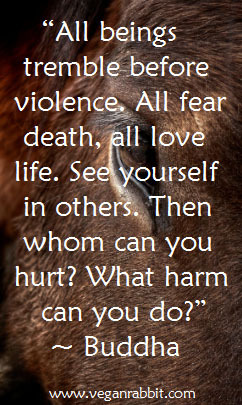 Instead, they focused on differences and used them as a reason to harm, rather than a reason to be kind. Is it truly ethical to in essence become the Ku Klux Klan, Stalin, Mussolini, Saddam, or Hitler over all the other animal species in the world simply because we think of ourselves as “better” than they are? “Suppose we choose time with our children — or the feelings of our parents or the bounty befitting revelry — over the lives of nonhuman animals… Eating meat ethically, on this view, requires explaining why we kill by pointing to other things of moral worth.” ~ For What Shall We Be Blamed — and Why? In the first example, it is not the chicken’s fault that the mother hasn’t educated herself on how to properly prepare lentils. In the second example, a young “vegetarian” actually eats meat “out of love” for his parents. Why couldn’t his parents simply cook him a vegetarian meal “out of love”? Why should the person with ethics be forced to compromise and not the people who choose to disregard it? In the third example, a family celebrates life and prosperity while perpetuating death. Couldn’t they have celebrated in a different way? Is the slaughter of an animal who had absolutely nothing to do with anything really necessary for celebration? In all three examples, it is never a good enough reason to kill. We don’t have to choose between spending time with our children, the feelings of our parents, or the bounty befitting revelry over the lives of nonhuman animals. Millions of vegans enjoy all of these every single day of their lives. We may not be perfect, but the least we can do is to try and to not make excuses for our unethical behavior. “The world is, after all, full of good things, the values of which are not obviously commensurable. Moreover, the quest for any one requires the sacrifice of others: even if we devote ourselves to preventing some evil, we invariably allow — and even participate in — far more that have equal claim to our energies.” ~ For What Shall We Be Blamed — and Why? Perfection may not be something attainable as we can foresee today, but it is still something that should be strived for. If we aren’t striving for perfection, what are we striving for? The definition of ethics is: “a theory or system of moral principles or values”. Upholding and practicing ones principles and values is something that should come naturally, provided we truly believe in them. An ethical person should not give up their principles for the sake of convenience. “Let’s not focus on whether there are strong moral reasons against a particular course of action: no doubt there are. Instead, let’s focus on where we should rank these reasons among the many that vie for our attention.” ~ For What Shall We Be Blamed — and Why? As long as we’re “ranking” morals in order of importance, let’s see which morals seem to be more important to vegans and which morals seem to be more important to non-vegans. Since vegans know that animal product consumption is inhumane, unsustainable (greenhouse gas production, topsoil erosion, groundwater contamination, ecological imbalance, endangered species extinction, deforestation, resource depletion, world hunger, etc. ), and unhealthy (heart disease, obesity, diabetes, etc. ), and because of this knowledge choose to abstain from it, what does this say about the prioritization of morals of non-vegans? To me, this was the most compelling argument in support of ethical meat. At first, it is very easy to read this essay and agree that yes, in vitro meat is ethical. 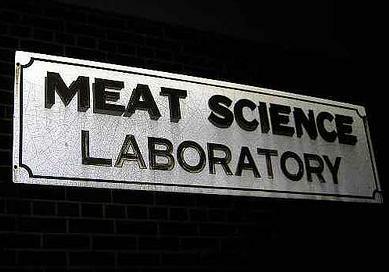 However, we must dig a little deeper to truly understand the ethical complexities of lab-grown meat. In vitro meat does indeed come without the health issues associated with animal defecation listed by the author such as E.coli and salmonella, however, many other unhealthy aspects will be retained such as cholesterol, fat, and animal protein. It is these three things that are causing four very widespread and deadly diseases and conditions our society faces and they are: cardiovascular disease, obesity, diabetes, and certain cancers (ex. : colon cancer). They are also linked to several autoimmune diseases, irritable bowel syndrome, migraines, erectile dysfunction, hormone imbalance, and even acne. While in vitro meat seems like a revelation, the basic idea really isn’t so new. Vegans have been eating near-identical meat, dairy, and egg alternatives for quite some time now, and these options have only been improving as the demand for them has grown exponentially. Brands like Tofurky, So Delicious / Purely Decadent, Light Life, Silk, Tofutti, Boca, Morningstar Farms, Amy’s, etc., have done an astounding job at making their alternative vegan products taste and texture almost exactly like the real thing. The only difference is that unlike in vitro meat, these products do not contain cholesterol and animal protein. The only reason someone might still shy away from these products is that they are only imitation, and not “real” animal products. On this issue, in vitro meat isn’t “real” meat either. Sure, it is made from real animal cells, but it is still very highly processed; one could argue that it is even more highly processed than the plant-based animal product alternatives consumed by so many vegans. What does any of this have to do with ethics? Remember, the definition of ethics is: “a theory or system of moral principles or values”. 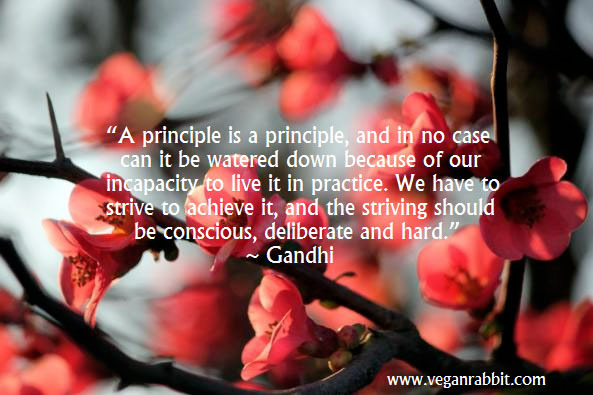 These principles apply to much more than animals or environment, they also apply to our own health. We must be ethical in our treatment of ourselves. In conclusion, it is easy to make excuses and gloss over the rough edges of what animal agriculture is based on. If we’ve learned anything from these essays it’s the extent of people’s ability to ignore and deny the truth. We can see that meat is inherently bad for animals, bad for our planet, and bad for our health. No matter how “humane”, “sustainable”, or “healthy” people try to make it, it will never be as humane, sustainable, and healthy as a whole foods, plant-based, vegan diet. Put your ethics where your mouth is — LIVE VEGAN. Once again Kara, you have eloquently organized your rebuttal in a cohesive, easily readable way! I will be referencing your blog in many arguments to come, so thank you for that. In this sense, she poses the questions… why is it appetizing and acceptable to eat cow, chicken or pig, but disgusting and repulsive to consider eating golden retriever or baby kitten? At what point do our beliefs take over and fool us into thinking that it a “given” and “ethical” to eat 6, maybe 7 species of animals but not any other animals.. Interesting take on the argument you are making here! Rima, I am so glad you enjoyed my post. And yes, I am familiar with Melanie Joy (and LOVE everything she does). About a week or so ago I remember you telling me you are connected to her somehow (at that vegan party in the marina). I love her invention of the words “carnism” and “carnist”, giving the ideology behind non-veganism a name. Unfortunately, I’ve found that many non-vegans find this term to be derogatory, whether we intend it that way or not. To us, it is what it is and if people are uncomfortable with what it means then they are perfectly able to change the behavior it describes, but to many non-vegans it’s just another insult. Anyway, that’s why I used the term “non-vegan” as opposed to “carnist”. While they are both neutral terms, “non-vegan” is perceived to be less threatening by non-vegans. Thanks so much for your comment, Rima! Why, if non-vegans react badly to the word carnist, do they proudly call themselves carnivores or omnivores, Kara? Is it that they know the former means that they have chosen this ideology and there is a current-day ethical connotation attached to that chosing? Excellent blog. Very well thought out and articulated. I’m going to mention it on James McWilliams’ Eating Plants blog on the NYT contest. I’m also going to try to find another of his blogs, in which a commenter explained in some detail the ethical implications of using animals for vat meat. I’ll come back here and link to that…. Oops, meant to write “attached to that choosing?” above…. I think it has to do with the idea that “carnist” is a name we have given them, whereas “carnivore” or “omnivore” is a name they have given themselves. 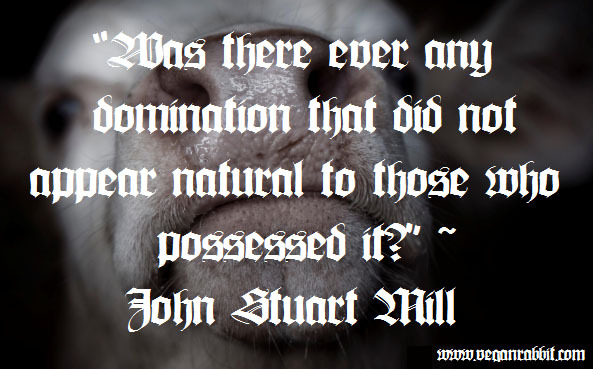 It could also have to do with the subconscious connection between “carnivore” seeming tough, rugged, and powerful, as well as the generally accepted term of “omnivore” being attributed to humans (though biologically we are not true omnivores). I really appreciate your kind words and love what you do (I have gotten a few of my quotes from your site, so thank you). I will take a look at those posts you have linked to. How You Spend Your Money Makes a Difference! I’m very flattered 😉 Thank you. Nice blog, my pleasure, looking forward to more writing 2012! Kara, this is truly brilliant! Your arguments are intelligent, solid, and persuasive. I wish everyone could read it! Thank you! You have the confidence and intellectual resolve to seek out these arguments; it’s as if you went into this not actually hoping to be persuaded but truly curious to see what they would come up with, like a skilled competitor eager to find a worthy opponent who would test your skills and then proceeding to exploit his flaws. I think you do prize intellectual rigor and are a truth seeker but you also jump into this sort of thing with an innate attitude of being on the side of the angels, if you will. Absolutely! I mean, it seems so obvious, you’d think that any reasonable person would see this. And thank you, thank you, thank you for exposing the silly “give thanks” argument for what it is: a self-serving way of assuaging one’s own guilt — as if this made up for needlessly taking an animal’s life! Another thing I am very impressed with is your marshalling of facts — and in a way that is well woven into the fabric of your argument. This is a truly forcible response to the contest arguments and needs to be read by everyone who might be swayed by them. A terrific job! Robb, I love your comments so much. Be careful or my head might grow so large it’ll explode lol. I am also bothered by the ex-vegans who have returned to a life of cruelty and death. Meat eaters love these people. It reminds me of the same “welcome back”, if you will, that happens when an ex-addict returns to their old junkie friends after a period of sobriety. I have to say that your post “The Courage of Our Convictions” (http://vegmonologues.com/2012/04/04/the-courage-of-our-convictions/) was excellent and I felt a little competitive myself after reading it 🙂 I’m looking forward to your next post. Thank you so much, Robb!!! Thank you, Kara, ye many layered champion of all creatures great and small. I’m glad I have you in my corner as I would not relish going up against you in a battle of wills. Perhaps one day we can join forces on a post that will prove a real vegan juggernaut. Hey, wait a minute — a comic book! Super Heroes! VEGAN JUGGERNAUT –Unstoppable Force of Compassion! Unstoppable Force of Reason! Unstoppable Ethical Power! What do you think?? Well formulated critique! I think you hit all the spots that hinged their very weak argument. One of the toughest for me is the bushmen and the Inuit examples. Yes, granted these folks don’t have access to the same quality/quantify of plant based foods as the developed world… But that doesn’t solve the justice or fairness issues for the victims that are killed. It’s still a difficult argument though – As not everyone can move into a different climate… If they were born in such a situation I’m not as troubled – It’s the folks that move into a place that necessitates killing for survival that I have a real gripe with. And as usual – None of those factors address the “here and now” that 99.9% of us in this conversation are part of. I agree with you about the Inuit and bushmen examples. The thing is, most people don’t fall into that category and using those examples as reasons for their own unethical eating habits when they live a few miles from a grocery store is completely irrelevant (as you said, the 99.9% of us who these examples do not describe). You’ve blown me away with your very reasoned and intelligent response to the NY Times essays. How I wish they would publish it! Thank you so much. I wish more people could read it as well! Kara is my daughter and I’m proud of her. Love you! ❤ ❤ ❤ I'm proud of you too! I'm so glad you have gone vegan. You have always been very into health and fitness (a master in six different martial arts) and have realized that there is no point in taking care of muscles and fitness without also taking care of the rest of your body as well. I'm so glad that your asthma and skin redness/splotchiness have gone away and I am also glad that you now feel more energetic than ever and are finally putting on some more muscle mass (since you're naturally thin, like me)! You don't know how proud I am to say that my dad is VEGAN. I love you!!! Please pay his site a visit. He runs a martial arts dojo in the Los Angeles area and trains mixed martial arts fighters in a system that incorporates the above mentioned practices into one called "Machatz". Vegan Rabbit, this is truly your manifesto. You exposed the logical flaws in the winning essay. The Times’ judges could have and should have declared that none of the essayists offered an airtight argument. Instead, they conferred legitimacy to a weak argument. Great work! Kol HaKavod to you! Excellent post! Made me think…. So how can a person accept 1., but reject 2. and not be guilty of hypocricy and speciesism? Actually the most “ethical” option of in vitro meat would involve horrific cruelty due to the use of Fetal Bovine Serum. FBS is used in nearly all culturing of mamallian cells. Every time you see a study involving “in vitro” work (provided they’re talking mammalian studies and not bacterial/yeast) you can safely bet they used FBS. I’ve read hundreds of studies and every single one has used FBS. FBS is obtained by draining the blood directly from the fetus’ heart after it has been ripped from its slaughtered mother’s uterus. Only the older, more well developed fetuses over three months are used, since the heart of a younger fetus is too small to puncture effectively. It is not known whether they are actually killed by the anoxia resulting from the mother being slaughtered or the draining of their blood. There are organizations working to promote non-animal-based serum alternatives within the scientific community. Despite the fact that chemical alternatives would actually be scientifically advantageous (more consistent composition, lack of microbial contamination, etc), old habits die hard, especially in science. Unless the “method” itself is the subject of study, results are expected to be obtained through accepted/established methods. This is also something advocacy groups pushing for in vitro work to replace animal testing must be aware of. In vitro is not necessarily any better, however it certainly can be if this issue is addressed. Of course there are other animal-derived products that need to be considered as well (e.g. antibodies), but FBS is far and away the most ubiquitous.